Like most companies, you’re probably fighting to differentiate your products and beat competitors to market. This means shortened cycles, intense stress, and even higher stakes. Surrounded by a whirlwind of activity, designers and engineers are finding themselves in a complex environment; both working to balance deadlines, while endeavoring to accurately predict product behavior. Those who’ve experienced this unenviable position will tell you, waiting for physical prototypes and relying on hand calculations can lead to bad product behavior. And unlike dealing with mischievous children, real-world design fails can’t be fixed with a five-minute trip to time out. Late failure means you’re met with costly setbacks and rework that put you right back on the starting line. Yes, this does sound a bit deflating, but now that we’ve got a feeling of being knocked down it’s time to get back up. Aberdeen Research recently conducted a study, “Virtual Prototyping vs. 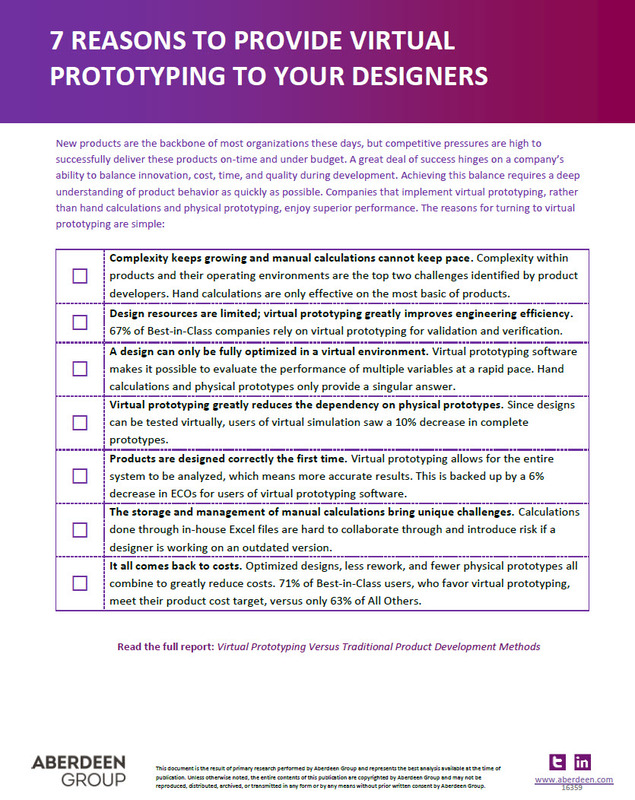 Traditional Product Development Methods” that shows how best-in-class companies are turning to virtual prototyping during the design process to understand exactly how designs will behave in the real world. So instead of ripping their hair out in the late stages of the product development process, companies are testing early and often while they design to optimize products and identify potential problems before they become actual issues. Click here to read the full report and put an end to bad product behavior before the threat of sitting in time out ever crosses your mind.